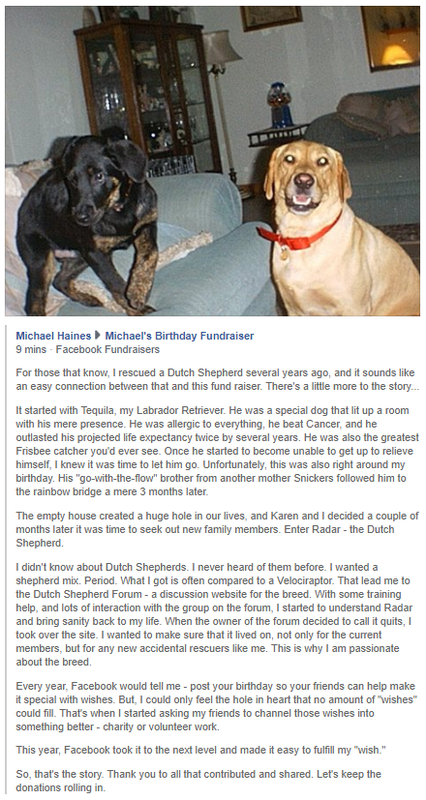 Every year, Facebook tells me I should notify my friends about my birthday, but my birthday brings sad memories of having to put my Lab (Tequila) down. In the past, I've posted to my friends that I would rather they consider donating time or money to a charity in lieu of Happy Birthday wishes. This year, Facebook made it so simple that it should be a no-brainer, so I started a fundraiser for my birthday. If you want to contribute, you can here on Facebook. I chose the North American Dutch Shepherd Rescue. Thank you to everyone that shared and donated. Thank you, Michael, and to everyone who donated!!! Happy Belated. Can I still donate? The Facebook fund raiser is closed, but I am sure NADSR takes donations through other channels.